Making tracks to the lighthouse. The sweeping view from the upper deck. 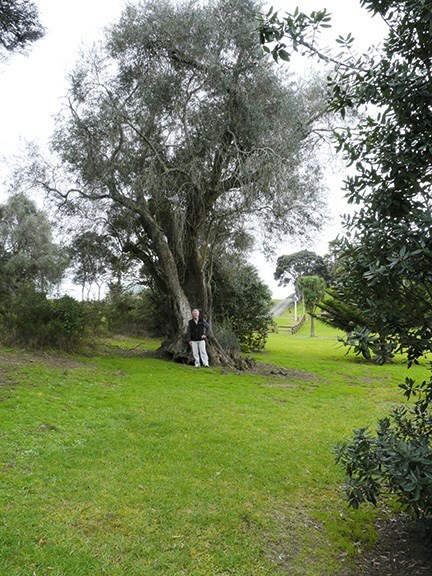 This olive tree, reputedly planted by a Spaniard named Da Silva is carbon dated to be 230-250 years old. The Navigator, the sand chariot, and Jock Wills with his three grandchildren. 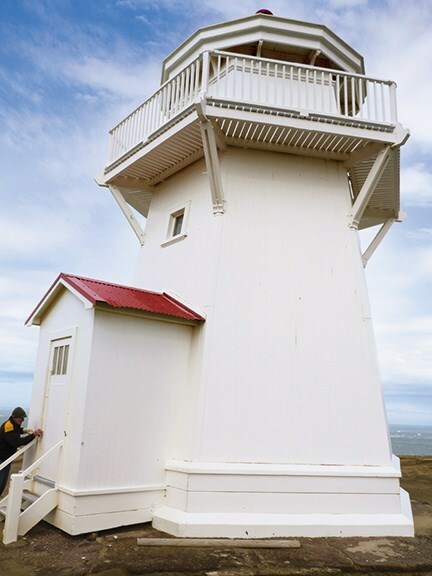 Pouto Lighthouse as seen from below. 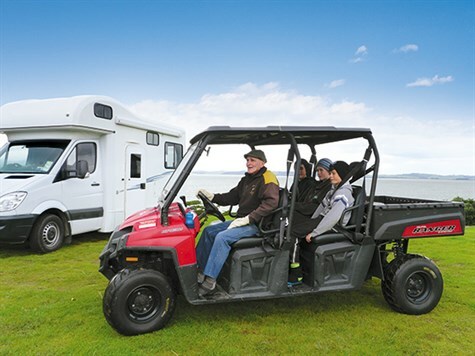 The first time I heard of Pouto Peninsula was from Motorhomes, Caravans and Destinations readers at a show. They were describing their favourite place to camp, and I made a mental note to one day go there. 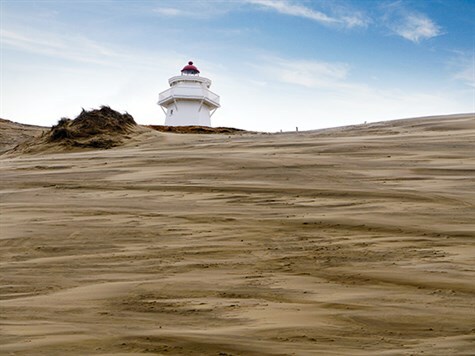 I had already begun to put a plan in place when my son told me he and his family had recently enjoyed a fantastic sand safari to the Pouto lighthouse. I mentioned it to Jill Malcolm, the former editor of MCD. She also raved about Pouto and the sand safari. By this time I couldn't wait to go there. As fate would have it, the stars aligned when I made arrangements to test drive an entry level four-berth Navigator motorhome from thl. With just four days to spare for a late winter getaway, the co-pilot and I agreed the time was right to take a tour of Kaipara Harbour. Naturally, this would include the much-touted Pouto Sand Safari. I love the Kaipara Harbour which combines in equal measures close up water-views (this is the largest harbour in the Southern Hemisphere) history and adventure. Oh, and throw in a lighthouse for good measure. I am a sucker for all history, especially maritime, and especially lighthouses. Taking the sand safari which combines all of these was a no brainer. Or so it seemed. I'm a bit of a chicken, but I will give most things a go. Anyway, I reasoned that the tour could not be too wild as my son had taken along his 20 month old daughter strapped into her car seat. And Jill is of a similar age to me – although I will readily admit she is far more intrepid. But with a nickname like Pollyanna, you'll get the picture that I'm a glass half full kind of gal. So descriptive phrases advertising the tour like "a hair-raising hoon over the sand dunes" didn't really hit home at the time. The first inkling that this may not be a stroll through the daffodils came when the caretaker of Pouto Marine Hall described our sand safari guide, Jock, as "a 75-year-old juvenile delinquent". However, Jock is a gentleman delinquent – polite and punctual – who arrived a fraction early for the trip to ask if it would be okay if he brought his three teenage grandchildren along for the ride. The co-pilot and I readily agreed. He because he's kind and affable; and me because I quietly reasoned that having the grandkids on board would mean Jock would take it a little easy on this lily-livered grandma. Yeah right. 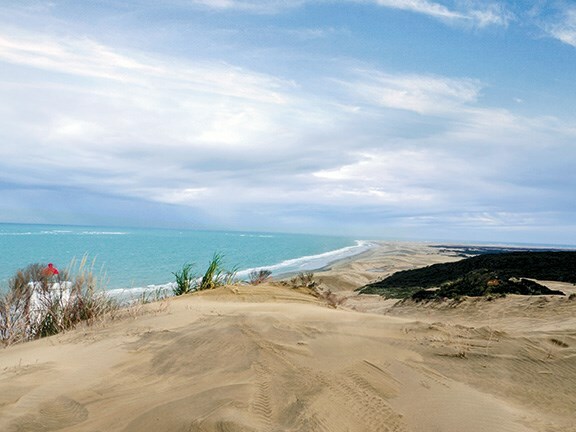 We started off well by driving along the beach, which is a designated road stretching from Pouto Point all the way to the top of Ninety Mile Beach. After encountering a seal pup, we looped around for a better look. As the pup lumped its way across the swirling sand, Jock asked if we were all set to go. "I'm not sure about the quality of the track; I haven't been on it since we had all that nasty weather," Jock yelled above the revving engine just at the moment a track of sorts (two ruts running through mud and sand) appeared ahead. I believe we gained air – twice – before the track began to resemble any kind of navigable surface. It was thrilling in a sort of terrifying way and everyone else seemed to be enjoying themselves quite a lot. I decided to lighten up and join in. I was just becoming attuned to the rough and tumble of the ruts when the lighthouse came into view and Jock stopped for a photo opportunity. Then, with a warning that even if the surface became undulating, we would have to keep on going if we were to top the dunes, we were off again at speed. On we whizzed over the dune tops with Jock stopping every now and then to point out a midden or to explain a pile of gnarled timber. This was everything I had hoped for. Jock is a knowledgeable guide who really knows the area's history and delights in sharing it. 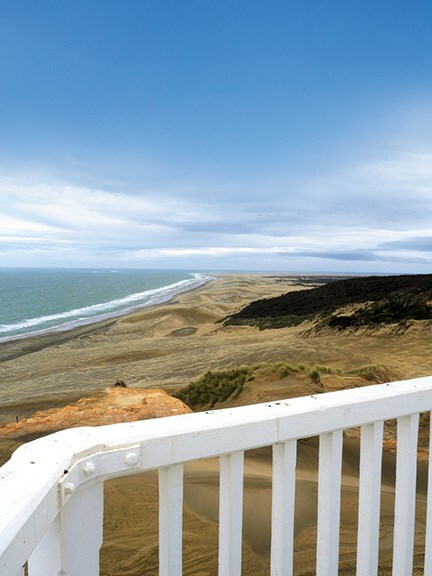 And so we learned that early Maori had laboriously carried every stone across the sand to create their fire pits. Looking around the area which is entirely made of sand as far as they eye can see; this is a fact that really hits home. By the time we pulled up near to a pile of immense weather beaten timbers, I would not have been surprised to have learnt that the hide-and-reveal of the wind swept dunes had long concealed a secret shipwreck the size of Noah's Ark. Instead, Jock told us the fascinating story of the lighthouse keeper and his apprentice, whose work to keep ships safe on the notorious Kaipara Harbour bar went way beyond manning and maintaining (see issue 120 of MCD). Shortly afterwards, I was required to dig deep into my own reserves of courage as he drove at speed towards fresh air; stopping for one terrifying moment at the lip of a ravine. It was at this moment that the word "No!" formed on my lips. Repeated thrice the cowardly refrain was all but drowned out by the racing engine as we plummeted some five metres down a 60 degree slope. Even as I was jubilant at surviving the ordeal, I feared a repeat performance. But I need not have worried. Gentleman Jock later repressed a grin as he told me over a cup of tea with local historian Logan Forrest that he had – at that point – upgraded my "grandmother's tour" to a "great grandmother's" tour. "Good" I said. "I want to live long enough to see my great grandchildren…"
Not just that, I hope to one day accompany them on a Pouto Sand Safari; for having laid bare my cowardly soul, let me assure you that this trip is the thrill of a lifetime and I would recommend it to anyone, of any age. Please note: with the sad passing of the inimitable Edward John (Jock) Wills, aged 77 years, Pouto Sand Safaris is now closed for business. (Updated 23 August 2016).